- Should I pray for my own needs? - Are any prayers too big or too small? - Are my prayers effective? - Are my prayers selfish? - Does praying really make a difference? Praying God's Word for Your Life gives women the direction and Scripture they need to bring purpose and power to their prayers. The simple strategies Kathi Lipp shares will create in women the habit of praying with renewed boldness, consistency, and expectation. And Kathi's warm, approachable style will make praying Scripture accessible to new believers and lifelong Christians alike. I loved her last book, Praying God's Word for Your Husband, so I was really excited to read this latest book from Kathi Lipp. She starts out with a How to use this Book chapter, which helps ease you into praying for your own needs. It is so hard to not feel selfish, but like the airplane attendants let us know, sometimes we have to take care of ourselves before we can best take care of others! God wants to know us, and He has asked us to pray. Kathi gives some great tips on how to set up your prayer time before moving on to Part 2 of the book. The stories will make you laugh and the scriptures will refresh you. 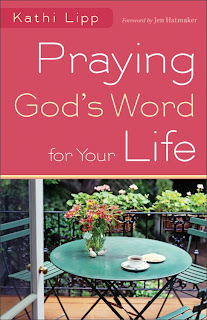 This is a great book to delve into praying for your own needs! Kathi Lipp is the author of Praying God's Word for Your Husband and a busy conference and retreat speaker who reaches thousands of women each year. She is the author of several books and has been a guest on numerous national radio programs, including Focus on the Family. She and her husband have four children and live in California. Find out more at www.kathilipp.com.